LA VILLA STRANGIATO is an Italian project by Gabriele Ferrari and Carlo Fattorini, two professional musicians that have extensive international experience. 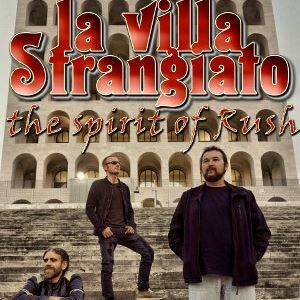 The original purpose of La Villa Strangiato was to revive Rush’s music of the ’70s and early ’80s – the period of their maximum popularity. The band formed in 2010 and, thanks to the contribution of several friends and musicians, they finally presented their first show (entirely dedicated to the album “Exit Stage Left”) in Rome in March 2011. Since then La Villa Strangiato have gone from strength to strength performing their Rush tribute in top, live music, venues and festivals all over Europe, culminating in 2014 with their first performance at “Rush Eucon” – the officially endorsed European convention of devoted Rush fans. Through 2014/15 La Villa Strangiato hit the road with a specially dedicated production entitled “Rush 40”, a concert designed in celebration of the 40th anniversary of the original band, taking in venues throught the UK and Europe. On 2016 still on tour with the “Signals under pressure” the band was also selected for play on The Rushfest Scotland with the original Rush producer Terry Brown. But the band’s greatest popularity is in the year 2017 with the show dedicated to the famous 2112 album. The success of this tour will grant to the band their second participation in the 2017 edition of “Rush Eucon” once again in the company of producer Terry Brown.